Shield your eyes, health-nuts. This one is as unhealthy as they come. But when a pregnant lady wants something, she will go out of her way to get it. INCLUDING making it for herself. In this case, I wanted NEEDED a buffalo chicken sandwich.The only issue is I did not want to pay for it. Can you say "CHEAP-O". Yes. You can. Now. Let's not over complicate this as there is essentially NO recipe. It was a weak, fly-by-the-seat-of-my-pants moment. But everyone is entitled to a brief indulgence, right?! Now, pour your oil into a medium size skillet and turn to 3/4 heat. In a food processor, blend up the crackers, garlic, seasoned salt, and parsley until very fine. If you don't have a food processor, a gallon sized zipper bag and a rolling pin will do. Then pour into a bowl. Scramble 3 eggs in a medium sized bowl. Dip trimmed chicken breast in eggs making sure to coat thoroughly. Dip (again thoroughly) in crumb mixture. 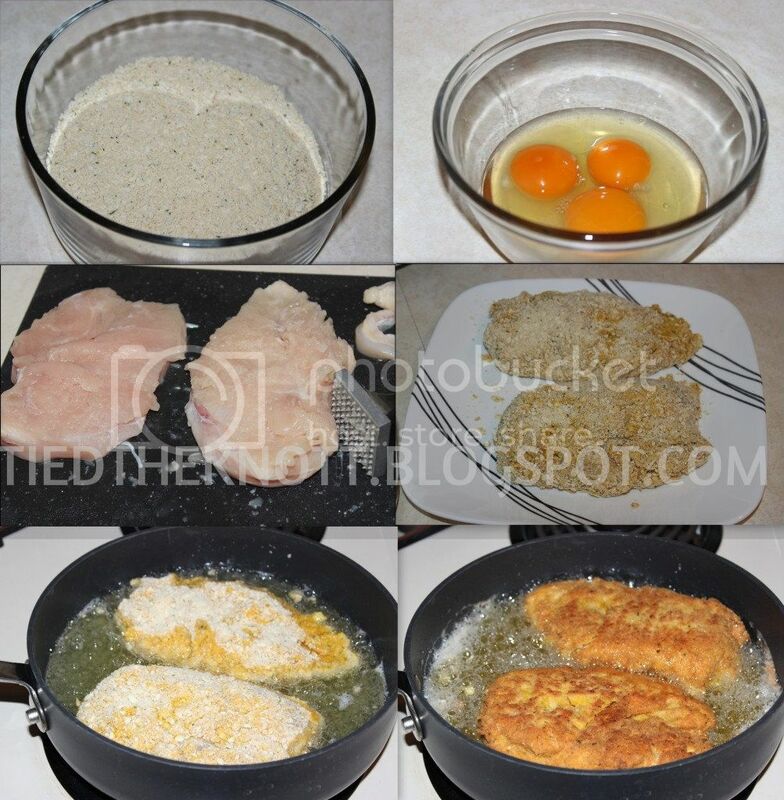 If you want your chicken SUPER crunchy, you can dip again in eggs then crumbs. Place in heated oil for about 10-15 minutes (really depends on the size of the chicken breast. Use your best judgement. Flip and cook until chicken is no longer pink! I am kind of finicky about chicken. It makes me nervous. You will normally see 2-3 cut marks in it as I have to check and re-check to make sure it is cooked through. 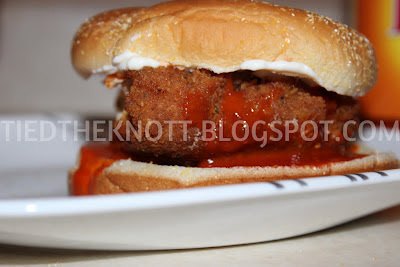 Split a bun, place 1/2 of your large chicken breast on the bun, and cover with buffalo sauce. I top my bun with mayo and Tyler uses ranch. I will let you make that executive decision. ***IF you want a healthier option, you can try baking the chicken at 350* until it is heated through. Now I am off to celebrate yet another birthday at a ball game. Hopefully this one doesn't go 13 innings like last year on my birthday!